19th-century schoolwork included lots of copying. 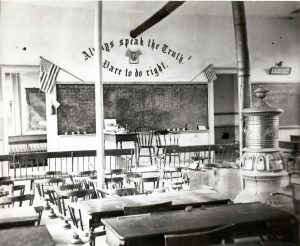 In this 1870s view of the district branch school on Lewis Street the teacher has written out sums for students to copy, probably from a textbook. In our exploration of schools in Geneva (see earlier posts here), we have seen how the local school district grew as the town did. 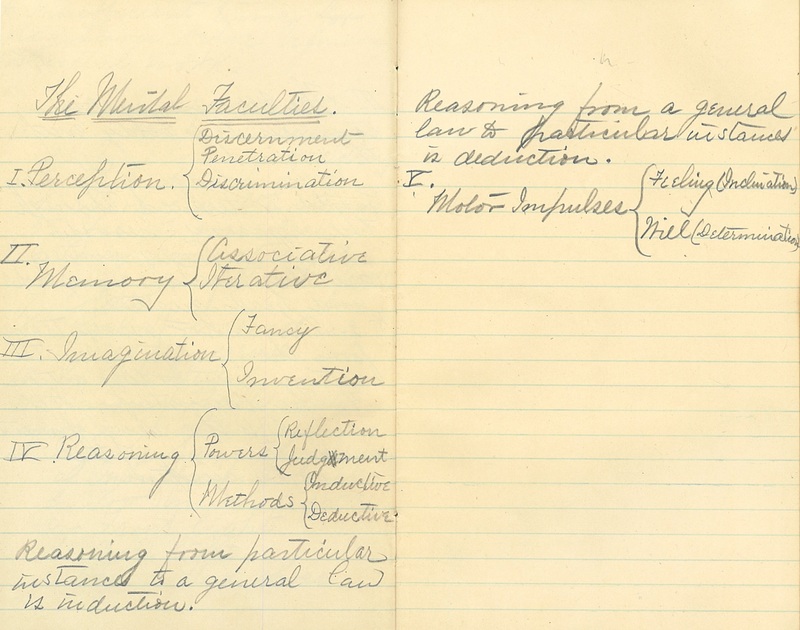 Although school organization changed, 19th-century schoolwork didn’t change at all. On the elementary level children studied the three Rs: Reading, ‘Riting and ‘Rithmetic. 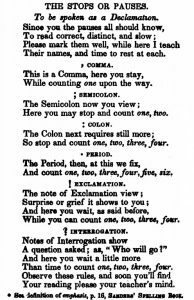 In 1849 the youngest pupils at Geneva’s Classical and Union School started with the alphabet, reading, spelling, and geography. Then they moved on to arithmetic, history, and writing (penmanship). Most children left school by 13, when they began to learn composition, science, higher mathematics, and languages. Traditional schoolwork focused on training the faculties, or mental capacities. Philosophers thought that the mind was made up of discrete parts, each of which controlled an aspect of thought. The three main faculties were the will, the emotions, and the intellect. Training the intellect by acquiring knowledge developed reasoning. Training the will and emotions would cultivate self-control and appreciation of beauty. The ultimate aim of education was for pupils to develop good character through the improvement of these faculties. 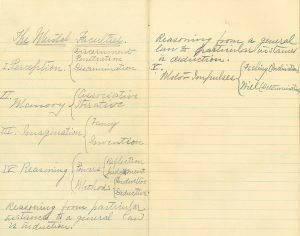 An unknown teacher’s late 1800s notes on the subject of mental faculties. To train the intellect, students were to memorize a body of knowledge and reproduce it through recitation or writing. This system of memorization and recitation was called mental discipline. It was based on the idea that the mind was like a muscle and memorizing provided regular exercise. Students memorized and repeated definitions, facts, mathematical problems and proofs, speeches, and poems from the primary years through college. Teachers acted as drill masters, rarely stopping the recitations to discuss meaning. An English observer wrote of American schooling: “Subjects are constantly ‘memorized’ without being understood, and hence their stay in the memory is precarious and transitory.” Creativity and communication of ideas were not the point. Rather students were to gain knowledge of a subject, not necessarily understanding. Students were drilled on the questions in their textbooks and were expected to give the answers verbatim from memory. Once one section was memorized they moved on to the next. Schools and teachers relied on textbooks to structure learning. Teachers placed students in groups based on their progress through the textbook. In small country schools there were few supplies, so lessons were oral. Teachers instructed individuals or small groups by reading aloud, and students repeated what was read. In large city districts books were provided. Students there were more likely to copy words repeatedly from the blackboard or from dictation. Students were expected to use exaggerated pauses and enunciation when reciting texts in school. 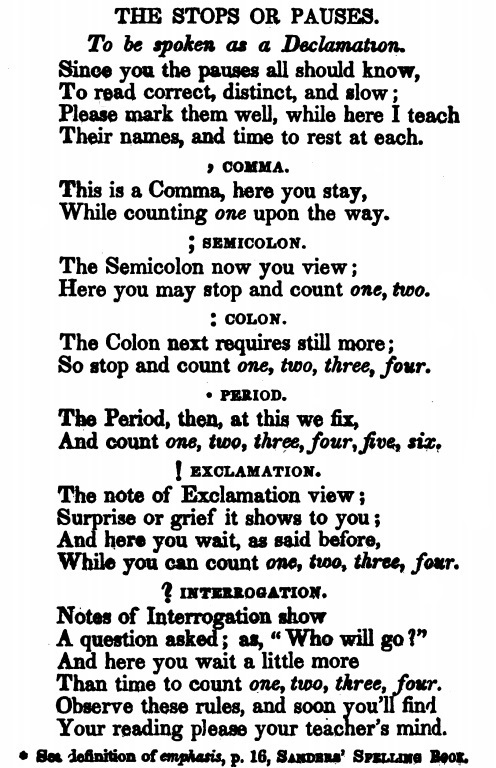 In the 1859 Geneva Gazette, the editor wrote about the Union School’s end-of-term exercises. The pupils sang songs, delivered speeches, shared drawn maps, and read compositions. 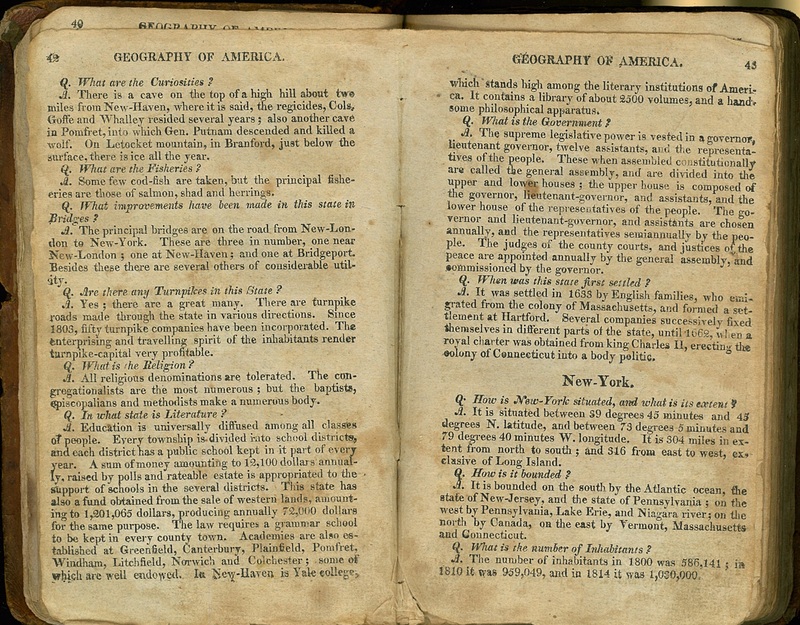 The speeches had such titles as “The Death of Henry Clay,” “The Pilgrim Fathers,” and “Sunday Evening Thoughts.” The editor called “the exercises…altogether the best we have ever attended in Geneva…” He praised speakers for their elocution and pronunciation. He criticized them for speaking too fast or too quietly. He was also impressed by the “perfect order” and “superior government” of the group. Such public exhibitions were the ultimate test of accomplishment in 19th-century schools. Leading educators and community members emphasized the importance of proper material for students to study. Texts were to reinforce behavioral codes and emphasized obedience, self-discipline and orderly behavior. Moral lessons were embedded in the texts in readers. Geneva’s district trustees took this responsibility seriously. 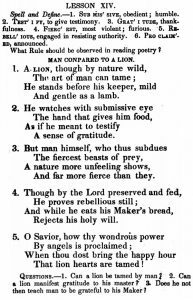 In 1839 they gave out a list of recommended texts for the district school which included Catherine Beecher’s Moral Instructor. Among the books recommended, we would call the attention of teachers to the Moral Instructor which supplies one of the most pressing wants of our schools. Its object is to illustrate the close connexion [sic] between doing right, and being happy, between virtue and sound prosperity. Not one taint of sectarianism impairs its value; clear, concise, sound and interesting, it merits a cordial welcome and a warm approval. We hope, before another year is passed, it will be a manual in every District School in Seneca. For most of the century, Americans thought that basic literacy and numeracy were sufficient education for public school students. The country was still rural and most common school students went on to work as farmers, laborers or housewives. However, as the country industrialized and people left farms to work in city factories, reformers began to agitate for educational reforms. 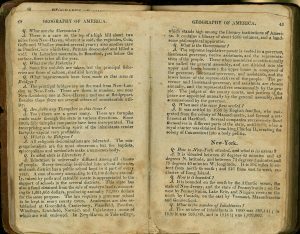 The waves of immigrants which came in growing numbers after the 1850s also prompted concerns about how to Americanize foreigners. Many saw the schools as the best place to teach American civic values to the newcomers. In our next installment we will look at the movement to reform the schools by professionalizing teaching, establishing high schools and reforming the curriculum. Finkelstein, Barbara. Governing the Young: Teacher Behavior in Popular Primary Schools in 19th-Century United States, 1989. Richards, Caroline Cowles. Village Life in America, 1912. Swett, John. 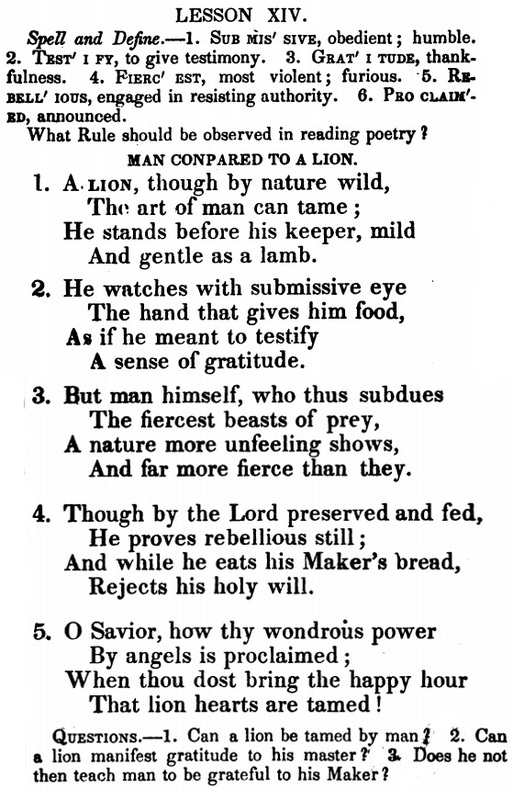 Methods Of Teaching: A Hand-Book Of Principles, Directions, And Working Models For Common-School Teachers, 1880.